Have you found a 1970 penny in your pocket change? You’re probably wondering about the value of these old pennies and if they’re worth keeping. Maybe you’ve heard certain 1970-S pennies from the San Francisco Mint are worth more than others — something about the size of their date. We’ve got the answers on what your 1970 pennies are worth, how to tell whether you’ve got the valuable 1970-S penny, and other cool facts about these old coins. The 1970 penny was made during some very tense times for the United States. The Vietnam War was in full tilt overseas. Back on the home front, protests had turned deadly — with events such as the Ohio National Guard shootings of Kent State University protestors redefining the peace movement. Pennies in 1970 were made from a composition of 95% copper and 5% zinc. 1970 pennies were also struck at the Philadelphia, Denver (“D”), and San Francisco (“S”) Mints. Many coin collectors are especially attuned to looking for the 1970-S Lincoln pennies because they come in 2 types of varieties. One of them is particularly valuable. The 1970-S Small Date penny is one of the scarcest, most sought-after of the regular-issue, business-strike Lincoln Memorial pennies — which were made from 1959 through 2008. 1970-S Small Date pennies aren’t rare coins, but they’re definitely much scarcer than the 1970-S Large Date Lincoln cents. You have to be very careful when buying coins advertised as 1970-S Small Date pennies. After spending some time searching for them on major auction websites, an experienced hobbyist is sure to spot at least a few 1970-S Large Date cents listed as 1970-S Small Date pennies. Whether this is intentional or an innocent oversight on the part of the seller is up for speculation, but there are some diagnostics for telling a 1970-S Small Date penny apart from a 1970-S Large Date Lincoln cent. If the tail of the loop of the “9” in the date points directly to the “7,” then it’s a 1970-S Small Date penny. When the end of the loop of the “9” points to the top of the mintmark, then it is a 1970-S Large Date cent. On 1970-S Small Date Lincoln cents, the top of the “7” in the date will be level with the tops of the “1,” “9,” and “0” also in the date. On 1970-S Large Date pennies, the top of the “7” is sunken below the imaginary plane that aligns the tops of the other digits in the date. The bottom of the “7” in the date on 1970-S Small Date Lincoln cents is on the same plane as the “1” and “0” also in the date. On 1970-S Large Date Lincoln cents, the base of the “7” slips just below the imaginary line along the bottoms of the “1” and “0” of the date. On most 1970-S Small Date Lincoln pennies, the inscription LIBERTY is weakly struck, whereas LIBERTY is generally stronger on 1970-S Large Date cents. 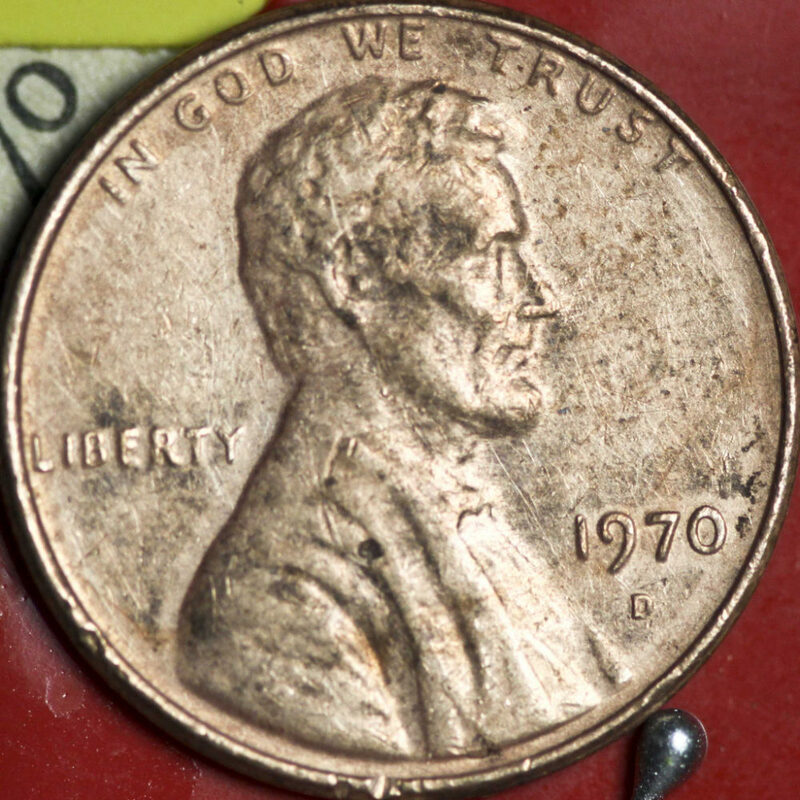 However, this diagnostic isn’t always foolproof, as LIBERTY is also weak on some 1970-S Large Date pennies. Therefore, this clue should be used in conjunction with the differences in the appearance of the date and not as a standalone diagnostic indicator. Luckily for astute coin collectors, there are still some 1970-S Small Date pennies to be found in circulation. However, this is a challenge that will definitely require patience if you wish to find 1970-S Small Date pennies in pocket change or through searching bank rolls. “S”-mint Lincoln pennies are getting much harder to find in circulation these days, but they really are out there! In addition to the business-strike 1970-S Small Date pennies, there are also 1970-S Small Date and 1970-S Large Date proof pennies. The most important way to tell these apart is to distinguish the date-related diagnostics — the same as with the circulation strikes. By the way, there are no attributed 1970-D (Denver) or 1970 (Philadelphia) Large and Small dates. There is, however, a 1970 doubled die penny. It’s the 1970-S Large Date doubled die penny, and it’s the 3rd most scarce major doubled die penny. Only about 50 are known to exist. You can tell a 1970-S doubled die cent by looking at its obverse (heads side). You’ll see doubling in the inscriptions LIBERTY and IN GOD WE TRUST. The date is also doubled. In addition to checking your spare change and bank rolls, you should also be looking for these 1970 pennies in uncirculated mint sets and proof sets. Mint sets and proof sets that contain the 1970-S Small Date penny are worth more than sets containing the 1970-S Large Date cent. How Much Are 1970 Pennies Worth? The 1970 penny is worth at least 2 cents, regardless of its condition. That’s thanks to the coin’s copper content — which is worth 2 cents. So save all of your 1970 pennies! *All values are for 1970 pennies in uncirculated or proof condition. What Else Happened When Your 1970 Penny Was Made? The war in Vietnam expanded as United States troops invaded neighboring Cambodia, prompting the protests at Kent State University that ended in fatal gunfire. The African nation of Rhodesia declared itself a republic. A massive earthquake in Peru killed 50,000. Top movies in 1970 included Patton, M*A*S*H, Love Story, and The Aristocats. Popular TV shows in 1970 were The Brady Bunch, The Mary Tyler Moore Show, The Partridge Family, and Gunsmoke. On the radio, chart-toppers included “Your Song” by Elton John, “I’ll Be There” by The Jackson 5, “My Sweet Lord” by George Harrison, “Fire and Rain” by James Taylor, and “25 or 6 to 4” by Chicago.